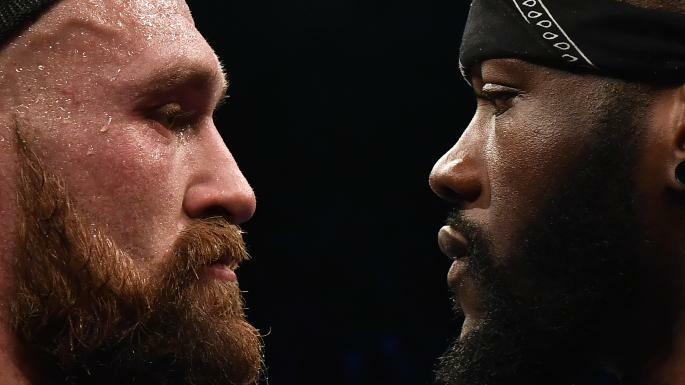 The heavyweight title fight between Deontay Wilder and Tyson Fury is not going to happen on November 17 in Las Vegas as originally planned. Sources told FightNights.com on Saturday afternoon that the fight "is definitely not going to happen on November 17th, but it is still possible for this year." When asked if the change was plan was due to Floyd Mayweather's announcement of a planned comeback to face Manny Pacquiao in December, the officials had nothing to say regarding Mayweather. A purse split and a venue have still yet to be agreed upon. Showtime, which will broadcast the pay-per-view, announced Wilder-Fury after Fury defeated Francesco Pianeta in a 10-round unanimous decision on August 18 in Belfast. Wilder, who attended ringside, exchanged words with Fury in the center of the ring before posing for photos. Wilder is coming off the most significant victory of his career following a 10th-round TKO of Luis Ortiz in March. A majority of ringside observers had Ortiz, a former interim champion, ahead at the time of the stoppage. Wilder had tried for years to land a big fight, but his attempts were snuffed out, and it was not of his own making. The 2008 Olympic bronze medalist has spent a large part of his career telling anyone that his desire in boxing was to face the best opponents the heavyweight division has to offer, which is what you would expect to hear from a loud, charismatic man. But landing that fight has not been so easy for Wilder. He agreed to go to Moscow to fight mandatory challenger Alexander Povetkin in May 2016, only for the Russian to test positive for a banned substance. Moreover, Wilder was initially slated to face Ortiz last November, but that fight was also canceled when Ortiz tested positive for two banned substances -- the second time Ortiz had been caught for performance-enhancing drugs. It was Wilder, who opted to give the Cuban defector a second chance at redemption. With Mayweather-Pacquiao II potentially happening in December, most certainly on Showtime pay-per-view, Wilder-Fury will likely get pushed back to 2019.